Summary: We report the CT myelography and MR findings of two cases of extraskeletal Ewing sarcoma involving the spinal epidural and paravertebral spaces in a middle-aged man (case 1) and a young woman (case 2). In both cases CT myelography showed epidural and paravertebral masses on one side, with widening of the ipsilateral neural foramina at the C5–C6 level in case 1 and at the C7–T1 level in case 2. On MR images, the masses were isointense to muscle on T1-weighted images, hyperintense on T2-weighted images, and showed moderate enhancement on contrast-enhanced T1-weighted images. In one case, all pulse sequences showed linear signal voids, representing the vertebral artery encasement within the mass. The intradural component connected with the main mass was detected in the other case. Extraskeletal Ewing sarcoma is a rare, soft-tissue malignant neoplasm histologically similar to skeletal Ewing sarcoma. It occurs predominantly in adolescents and young adults between the ages of 10 and 30 years, and follows an aggressive course, with a high recurrence rate. It commonly affects the paraverterbral regions, but the involvement of the epidural space is uncommon. Although the clinical and pathologic features of extraskeletal Ewing sarcoma have been documented, to our knowledge only a few reports (1–3) have dealt with the MR imaging findings of this disease. 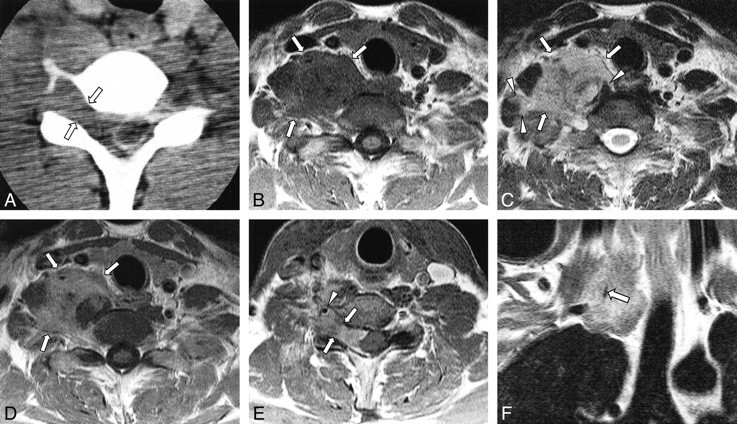 We describe the MR imaging findings of two cases of extraskeletal Ewing sarcoma located in the spinal epidural and paravertebral spaces. A 38-year-old man presented with a 6-month history of right shoulder pain. CT myelography revealed a large, right epidural and paravertebral mass displacing the thecal sac to the left at the C5–C6 and C6–C7 levels (Fig 1A). Ipsilateral neural foraminal widening was detected at the C5–C6 level (Fig 1A). The nature of the neural foraminal widening was smooth, without permeative destruction or sclerotic bony change. Case 2: 38-year-old man with right shoulder pain. A, CT myelography shows an epidural mass displacing the thecal sac to the left side at the C5–C6 level. The ipsilateral neural foraminal widening is observed (arrows). B and C, T1-weighted (B, 418/12/2 [TR/TE/excitations]) and T2-weighted (C, 3648/99/2) axial MR images show a large mass (arrows) in the right paravertebral space at the C6–C7 level, which is isointense to muscle with T1 weighting (B) and hyperintense to muscle with T2 weighting (C). The mass displaces the thyroid gland, right common carotid artery and right internal jugular vein anteriorly, and right scalene muscle laterally. This mass surrounds the adjacent muscles (arrowheads in C), suggesting the infiltrative nature of the tumor. D and E, Contrast-enhanced T1-weighted (418/12/2) axial MR images (D, C6–C7 level; E, C5–C6 level) reveal slightly inhomogeneous, moderate enhancement of the mass (arrows in D). Ipsilateral neural foraminal widening (arrows in E) and an encased ipsilateral vertebral artery (arrowhead in E) are also observed. F, Contrast-enhanced T1-weighted (400/12/2) coronal image clearly shows the encased right vertebral artery traversing the mass. On MR images, the mass was located in the right paravertebral space, displacing the thyroid gland, the right common carotid artery and the right internal jugular vein anteriorly, and the right anterior scalene muscle laterally. The mass surrounded the right longus colli muscle, the right anterior scalene muscle, and the right vertebral artery partially or completely, suggesting the infiltrative nature of this tumor. The mass was isointense to muscle on T1-weighted images (Fig 1B), hyperintense on T2-weighted images (Fig 1C), and showed slightly inhomogeneous, moderate enhancement on contrast-enhanced T1-weighted images (Fig 1D–F). With all pulse sequences, the linear signal voids representing the vertebral artery were noted to traverse through the mass (Fig 1F). Conventional vertebral angiography was performed in order to ascertain the degree of the vertebral artery encasement and showed focal narrowing at the C6–C7 level. There was no abnormal lymphadenopathy in either neck area. CT scans of the chest, abdomen, and pelvis showed no distant metastasis. A soft, dark-brown epidural and paravertebral tumor was found at surgery and was removed subtotally. The ventral paravertebral tumor was rather fibrotic and adhered to the surrounding soft tissues. Microscopically, the lesion was composed of sheets of fairly uniform round-to-oval cells (Fig 2). The cytoplasm was relatively clear and indistinct, but contained large quantities of periodic acid-Schiff (PAS)-positive, diastase-digestible material, indicating high concentrations of glycogen (not shown). 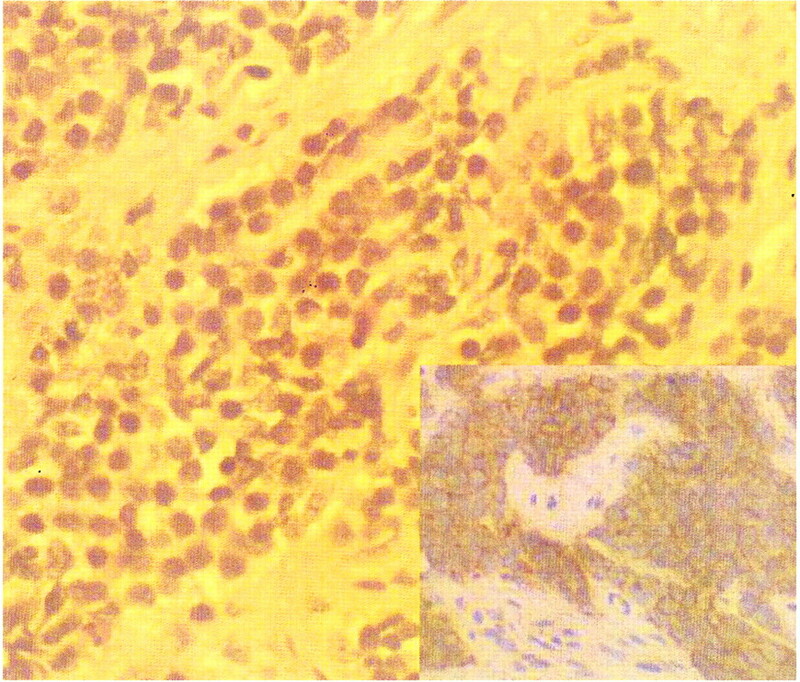 The tumor cells showed diffuse, intense membrane reactivity for CD99 (MIC 2) on immunohistochemical staining (Fig 2). The diagnosis was thus extraskeletal Ewing sarcoma. The patient received chemotherapy treatment (mesna, adriamycin, ifosfamide, dacarbazine regimen), and there was improvement of his symptoms over the ensuing 5 months at the time of writing this report. A 22-year-old woman presented with a 2-month history of numbness and paresthesia of the medial side of her right forearm. She also complained of sharp pain on the ulnar side of her right hand. CT myelography revealed a right epidural mass displacing the thecal sac to the left at the C7–T1 level. There was an intradural component connected with the epidural mass on right side of the thecal sac (Fig 3A). Ipsilateral neural foraminal widening was detected at the same level. The nature of the neural foraminal widening was smooth, without permeative destruction or sclerotic bony change. Case 2: 22-year-old woman with numbness of right forearm. A, CT myelography shows an epidural mass displacing the thecal sac to the left side and intradural filling defects (arrowheads), representing the intradural component at the C7–T1 level. Ipsilateral neural foraminal widening is evident (arrows). B and C, T1-weighted (B, 500/12/2) and T2-weighted (C, 3200/96/2) axial MR images show a well-demarcated epidural mass at the C7–T1 level, which is isointense to muscle with T1 weighting (B) and hyperintense to muscles with T2 weighting (C). Ipsilateral neural foraminal widening is also observed (arrows). D, Contrast-enhanced T1-weighted (500/12/2) axial MR image reveals homogeneous, moderate enhancement. The enhancing intradural component connected to the epidural mass is clearly visible within the right side of the thecal sac (arrowheads). 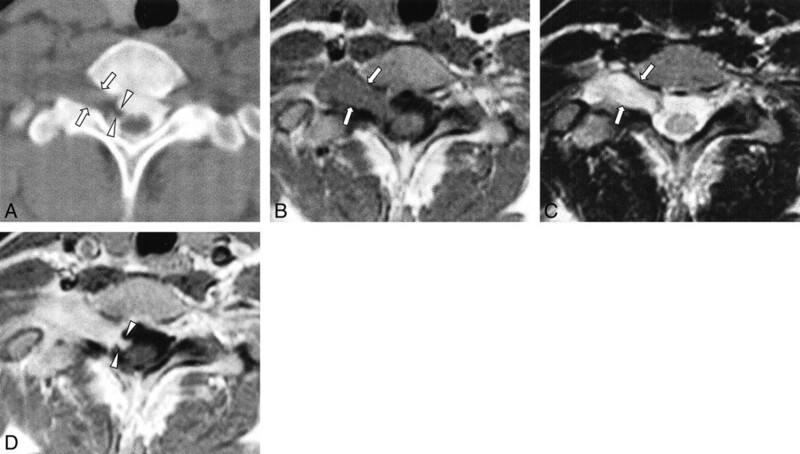 On MR images, the epidural and paravertebral mass was well demarcated from the adjacent structures, was isointense to muscle on T1-weighted images (Fig 3B) and hyperintense on T2-weighted images (Fig 3C), and showed homogeneous, moderate enhancement on contrast-enhanced T1-weighted images (Fig 3D). An intradural component, which was continuous with the main epidural mass, was also detected on MR images (Fig 3B–D). There was no evidence of abnormal lymphadenopathy or distant metastasis. Gross total removal of the intradural tumor and subtotal removal of the epidural and paravertebral tumors were performed. The gray-to-brown intradural portion of the tumor was found to be intermingled with the ventral rootlets of the C8 nerve root. The extraforaminal portion of the C8 nerve root was swollen owing to tumor infiltration. The microscopic findings were the same as with case 1. The patient refused the scheduled chemotherapy except for the first two cycles (cyclophosphamide, vincristine, adriamycin, dacarbazine [CYVADIC] regimen). Nonetheless, she has remained healthy, except for mild, right ulnar nerve deficit for 4 years. Most of the primary neoplasms arising within the spinal epidural space are lymphoma, nerve sheath tumor, meningioma, and hemangioma. Other types of primary spinal epidural neoplasms are rare, one being extraskeletal Ewing sarcoma, which is an undifferentiated, small, round-to-oval cell tumor of uncertain origin. It differs in presentation from skeletal Ewing sarcoma in several respects. The average age of occurrence is 20 years, in contrast to 10 years for skeletal Ewing sarcoma. Extraskeletal Ewing sarcoma occurs equally in both sexes, whereas skeletal Ewing sarcoma has a 2:1 male predilection (4, 5). Extraskeletal Ewing sarcoma commonly affects the extremities, (especially the lower extremities), soft tissues of the trunk such as paravertebral and intercostal regions, head and neck, pelvis, and peritoneum. In contrast, skeletal Ewing sarcoma has a predilection for the long bones of the lower extremities (4). Other rare reported locations of extraskeletal Ewing sarcoma are various and include the mediastinum, heart, external genitalia, and broad ligament (5–7). In our cases, the tumors were located in the epidural and paravertebral spaces and accompanied with smooth widening of the ipsilateral neural foramina, thereby mimicking nerve sheath tumors. Although there is a 12% to 31% incidence in previous studies of the paravertebral area being the primary location (4, 8), involvement of the epidural space is relatively uncommon (9–11). Furthermore, in our case 2, the intradural component was detected by CT myelography and MR imaging and confirmed at surgery. To our knowledge, such an intradural extension has not been reported previously in the literature. The review of a reported clinical presentation of extraskeletal Ewing sarcoma arising primarily in the spinal epidural space included back and/or radicular pain (100%), paresis of one or both legs (83%), sensory disturbances, and bladder and bowel dysfunction (10), and these symptoms are consistent with those in our cases. These symptoms are also comparable with those reported in other spinal epidural disorders. The tumor tends to spread locally, infiltrating deep fascial spaces and invading muscles or skeletal structures as well as other adjacent structures (8). In our cases, the mass infiltrated both the longus colli muscle and anterior scalene muscle in case 1 and infiltrated the C8 nerve root with resultant ulnar nerve palsy, showing an intradural component along the ventral C8 rootlets, in case 2. Therefore, it can be suggested that extraskeletal Ewing sarcoma may have a propensity for perineural extension. The reported CT finding of extraskeletal Ewing sarcoma is most commonly a heterogeneously enhancing mass (6, 12, 13). Occasionally, a central, nonenhancing, low-density area is seen within the mass (9, 13). In our cases, CT myelography showed the epidural mass displaced the contrast-filled thecal sac, as was seen in one previous report (4), and accompanied the ipsilateral neural foraminal widening. The nature of the neural foraminal widening was smooth, without permeative destruction or sclerotic bony change. Such a nonspecific, smooth neural foraminal widening can be seen in both benign and malignant epidural neoplasms, therefore not contributing to the specific differential diagnosis. However, the lack of permeative bony change suggests the relatively slow and lesser aggressive growth pattern. On MR images, this tumor is generally of low-to-isointense signal compared with muscle on T1-weighted images, of high signal intensity on T2-weighted images, and exhibits heterogeneous enhancement (1–3). The MR findings in our two cases were similar to those of previous reports; however, these MR findings are nonspecific. The preferred differential diagnoses of epidural tumors other than extraskeletal Ewing sarcoma include primary or metastatic malignancies such as lymphoma, leukemic infiltration, and various epidural metastases (especially those originating from the prostate, breast, and lung) and other rare benign epidural neoplasms (10, 11). As the radiologic findings of these epidural malignancies are similar to each other, it is difficult to distinguish them prior to surgical diagnosis. Benign epidural neoplasms are relatively rare and include nerve sheath tumor, meningioma, and hemangioma; all differ from epidural malignancies by their smooth tumor margin and lack of infiltrative growth pattern, suggesting benign tumors, and rather typical MR signal characteristics in some selected cases. Clinically, intervertebral disk herniation may be the most important differential diagnosis, especially in adolescents and adults (10, 11). Surgery is mandatory for spinal decompression and for identifying the tumor. Radiotherapy and chemotherapy can further retard spread of disease (9). Therefore, wide surgical resection with follow-up local irradiation and chemotherapy offer the best chance for long-term disease-free survival (1), although both local recurrences and distant metastases are common in spinal epidural extraskeletal Ewing sarcoma (10). The recently reported 5-year survival rate of extraskeletal Ewing sarcoma is 61% (15), whereas that of skeletal Ewing sarcoma is approximately 10%. In conclusion, although quite rare, extraskeletal Ewing sarcoma should be included in the differential diagnosis of epidural mass lesions. 1 Address reprint requests to Ho Kyu Lee, M.D., Department of Radiology, Asan Medical Center, 388-1 Poongnap-Dong, Songpa-Ku, Seoul 138-736, South Korea.